'Its Another World Record — Album Cover Art. a new book from Geoff Hocking. of classical music, good graphic design, collectors and ephemerists alike.. Published by New Chum Press, this 320 page book, released in March 2009, celebrates the excellence in the design of album covers that came from the Melbourne-based studio in the late fifties and the sixties. At 320 pages, full-colour throughout, hardback, this is a big book – featuring fabulous reproductions of more than 500 album covers, a short company history and biographies of several of the artists. Geoff is available for a chat – with experience in radio and television interviews. a veteran of John Faine's 'Conversation Hour', 'Good Morning Australia with Kerry-Anne Kennerley'; interviews with the ABC's Derek Guille, Tony Delroy, Julie Copeland and commercial stations across all Australian capitals. for designers and design students." "Congratulations on your new book: it looks amazingly comprehensive" – Mimmo Cozzolino. 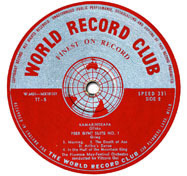 The World Record Club began in Britain in 1958 and established its Australian counterpart two years later with its own design studio at 303 Flinders Lane, Melbourne, and later, on Burwood Road in suburban Hartwell. Founding director, John Day [above right] had been an advertising copywriter with magazine and book publishers Herald Colorgravure. He travelled to London in the late fifties where he met merchant banker Norman Lonsdale, record producer Fiona Bentley and their friend, the young actor Richard Attenborough. Together they began the World Record Club a mail-order, record distribution company specialising in classical recording sourced from emerging European artists. Although Attenborough played no active part in the running of the company he was a vital link to the world of entertainment for the others. Founding art director Geoff Digby, who had previously worked with Day in Melbourne and again in London, returned to Australia to establish the studio [Day returned two years later]. 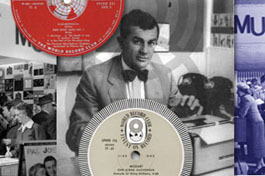 The World Record Club took an unusual marketing stance–as it was essentially a direct-mail operation [it did eventually have storefronts in every capital city in Australia and New Zealand, the Flinders Lane, Melbourne, display centre is shown at right], selling forward releases by two six-monthly catalogues, WRC Australia decided to create new jacket art for for every release. WRC sourced its early catalogue from emerging European orchestras, young soloists and from 'boutique' European publishers, it was desirable to jacket every release in what was to become known as the classic World Record style – creative artwork, modern designs with limited colour, often spare typography, glorious illustrations and esoteric photography. World Record Club stood like a beacon in the Australian commercial art industry and a generation of the most creative young Australian designers, illustrators, typographers, visual artists and photographers were drawn into Geoff Digby's milleau like moths to a flame. The company prepared artwork for more than 2000 new jacket designs in the twenty years of its operation in Australia and New Zealand before it was finally taken over by EMI in 1975. EMI had been manufacturing WRC product since the beginning, and after the takeover began to import finished film for printing direct from overseas labels. In retrospect, the best years were the early years. From the establishment of the studio, right through the sixties, World Record Club was its own master, cover designs were whatever the designers wanted them to be, designers were encourged to be adventurous by Geoff Digby, although always under the watchful eye of founder John Day, and the staff writers Harvey Blanks, Alex Berry, James Murdoch and John Pinkney, who also had their own ideas about what designs should look like. This made for some interesting exchanges on the studio floor at times and designers soon became very familiar with the music so they could battle it out with the writers in defence of their, often esoteric, ideas from a position of knowledge and strength. In almost every case the company was keen to break new ground, to create exciting covers, and covers that always said 'World Record Club'. That style was unmistakable — clever graphics, great illustrations, spare typography and limited colour — World Record Club covers looked like no other and won all the awards for that very reason. World Record Club set the benchmark and every designer involved was keen to reach it — and then some more. The book features reproductions of more than 500 album covers from the studio of the World Record Club guided by the founding art director Geoff Digby. [In November 2008 Geoff Digby was inducted into the Australian Graphic Designers, AGDA, Hall of Fame]. The studio at WRC is still regarded today as one of the most influential studios of the period. The hudreds of cover designs created more than 40 years ago still stand today as classic artworks. Harvey Blanks, James Murdoch and John Pinkney. Other visual artists who contributed to WRC include Charles Blackman, Albert Tucker, John Olsen, Roger Kemp and Louis Kahan.